The Nebraska Democratic Party on Thursday removed one of its officials after a recording surfaced of him saying he was glad House Majority Whip Steve Scalise (R., La.) got shot and wished he died. Phil Montag, who served as volunteer co-chairman of the party's technology committee, was fired after his comments were released, local Fox affiliate KPTM reported. Montag made the remarks during a private meeting with the party's Black Caucus chairwoman, Chelsey Gentry-Tipton, and a friend of hers, Destin Madison. "His whole job is to get people, convince Republicans to [expletive] kick people off [expletive] health care. I'm glad he got shot," Montag said of Scalise in the audio recording. "I'm not going to [expletive] say that in public." Montag later added, "I wish he was [expletive] dead." Madison then told Montag on the tape that he had secretly recorded his remarks and planned to publicize them, according to the Associated Press. The audio recording was later posted on YouTube. Nebraska Democratic Party chairwoman Jane Kleeb confirmed to KPTM that it was Montag's voice on the 42-second recording and said she has ousted him. 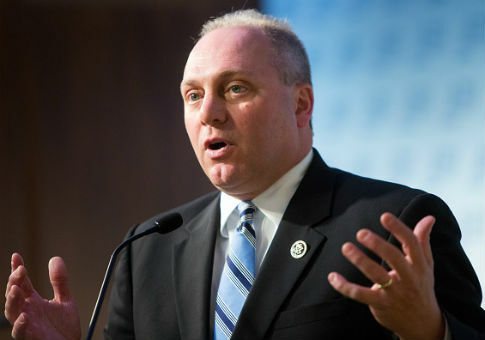 Scalise was shot in the hip last week along with four others after a gunman opened fire on a Republican congressional baseball practice in Alexandria, Va. The shooter, James T. Hodgkinson, was an avid supporter of Sen. Bernie Sanders (I., Vt.) who had a deep hatred of Republicans and President Donald Trump. Scalise is still in the hospital and his condition has been upgraded from "serious" to "fair." Montag told the Omaha World-Herald he was "horrified" by the shooting and "absolutely" did not wish Scalise was dead. He added that the recording was part of a 30-minute conversation that had been edited to take his words out of context. "I did not call for the congressman's death," Montag said. Montag is not the only Nebraska Democratic Party official to come under scrutiny after the Scalise shooting. Gentry-Tipson faced criticism last week for saying online that it was "so funny" to watch Republicans "crying" about the Scalise shooting on live television. She added that it is "hard to feel bad" for Republicans who use the National Rifle Association to "pad their pockets with complete disregard for human life." "The very people that push pro NRA legislation in efforts to pad their pockets with complete disregard for human life. Yeah, having a hard time feeling bad for them," Gentry-Tipson wrote in a Facebook post. Later in a separate post, she said she did not condone the shooting nor find it funny. Montag told the World-Herald that Gentry-Tipson and Madison were trying to use the recording to blackmail him into posting a public statement in support for her. Kleeb called on Gentry-Tipson to resign for her comments but could not fire her because she holds an elected position, the AP noted. Kleeb said her party condemns all violent rhetoric. "Violent comments about anyone whether they are an elected official or a kid on the street are unacceptable," Kleeb said. "The political rhetoric is so off the cliff of reality I fear where our body politic is headed." This entry was posted in Politics and tagged Democratic Party, Democrats, Nebraska, Steve Scalise. Bookmark the permalink.